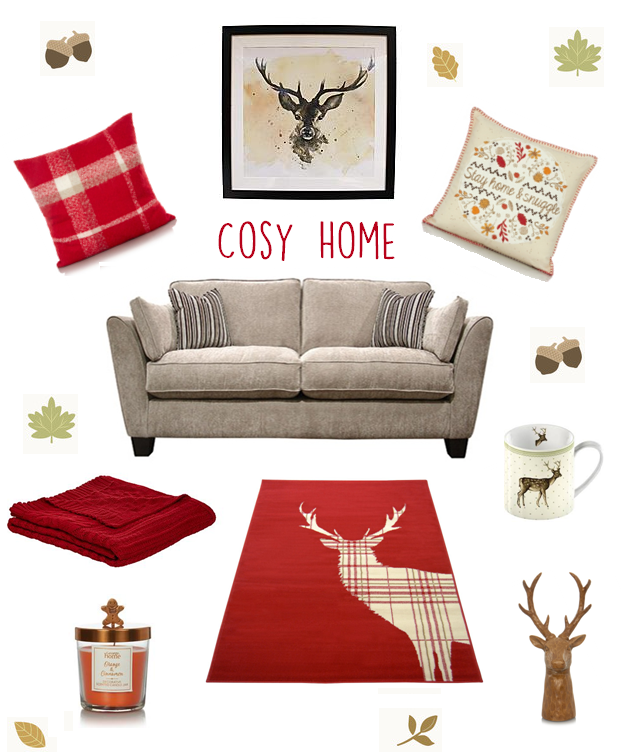 As soon as autumn hits I’m all about fairy lights, spicy scented candles and cosy cushions! There’s nothing I love more then snuggling up on the sofa on a dark chilly evening after work with a hot chocolate. It’s almost time for me to bring out my autumn/winter decorations and bedding which get more and more festive towards Christmas! Each season I can’t help but do a little bit of window shopping for new homewares and there are some really gorgeous cute around at the moment. George at Asda especially has some really cute bits and pieces on their website and so cheap.. I want everything! I thought I’d do a little blog post on how to create a cosy living room centered around a comfy family sofa. Every sofa needs some seasonal themed scatter cushions like these sweet ones from Asda on and a nice thick cosy throw. Each year I always have a bit of a thing for stags and reindeer and I absolutely love the checked stag rug and framed print. There are so many stunning accessories around at this time of year! It might also be worth checking out voucher sites like mamma.com as you can often get discounts to make your purchase cheaper.